ACHIEVEMENT Custom Building with Potton enables you to live in a home that truly suits you. You get to create your dream home, inspired by the Design Guide. GREAT LOCATION Holywell Lane is a low density site served by a private road in a secluded setting, but within easy reach of Telford town centre and road links. ADDING VALUE By opting to work on your Custom Build home, you can save thousands on the cost of your finished home compared to buying one the same size from a developer. 'Sweat Equity' is a great way to build up equity in your home. REDUCES RISK With Potton, it is much easier and less risky to build your dream home. We deal with all aspects of design and requirements of the planning permission. We also make sure your plot is fully serviced and ready to build as well as providing a market leading structural envelope for your home. The Guide Price is made up of the Plot Purchase Price of �84,000 and a Guide Build Cost of �192,000. The build cost is for guidance only and the actual build cost will vary depending on your individual design, specification, plot conditions and method of build procurement chosen. Potton have been delivering bespoke, high quality self-build properties on behalf of its customers for over 50 years. At Holywell Lane, it's your choice. You can purchase a serviced plot and decide which suits your aspiration needs and budget. Each house can then be customised to your bespoke requirement. You can tailor the design to suit you by adding or subtracting rooms, changing layouts or even house type, as long as it meets the requirements of the Design Guide. You can arrange for your home to be project-managed or engage with a contractor to build all or part of your home. Potton will provide the design solution and enable your choice of route to build. Plots at Holywell, Telford will come with Outline Planning Permission already granted for 17 new dwellings, all of which offer contemporary Custom Build design options. The entrance opens to paved roads and footpaths to access a layout thoughtfully developed to provide a linear, small community setting. Bordered by natural woodland areas to the east and west, Holywell Lane is a hidden gem which offers a unique custom build living experience. What exactly am I buying? 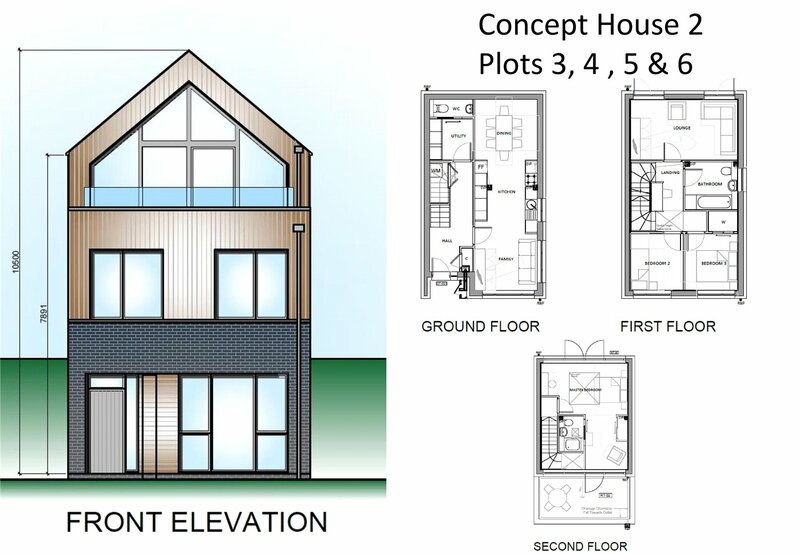 A fully prepared plot with outline Planning Consent and a commitment to design and build a Potton House. Access roads will be constructed and services installed to enable full, unobstructed access for construction purposes. Your prepared plot will be fully ready for construction work to begin following completion of enabling works (by others). A one off fee of �7,000 + VAT will secure a full design and planning service by Potton to provide a detailed design, together with full Potton support package The commitment to purchase as part of the design process "the Potton Package" - choice of insulated Potton Structural System, windows, doors and stairs. How does the design service work? Once you have completed your design brief, Potton's experienced team of architectural designers will work with you to develop a design to meet your requirements. We will ensure that the design we create for you follows the guidance given in the Design Guide agreed with the Planning Authority and meets with the requirements of the Conditions of the Outline Planning Consent, to achieve a Full Planning Consent for your home. When you have completed your plot purchase, Potton will prepare a package* of Building Regulations information for submission and approval. *The package includes all information required by most approval authorities except for foundation and ground floor structural design. If you're interested in building a home at Holywell Lane then please contact us at Nock Deighton, Tel : 01952 292300, Email telford@nockdeighton.co.uk, Website: www.nockdeighton.co.uk. Potton will work with you while your financial position is qualified, which will enable you to proceed with an initial design consultation with one of the Potton team. After this, and once you are sure that you want to progress you can secure a plot by paying the �2,000 (non-refundable) reservation fee. At this stage we will take your plot off the market for up to 6 months whilst we work with you to develop your design. During this period we will be busy arranging the infrastructure and services construction work for the whole site. We will support you in the consultation process with project manager or turnkey contractor. Once infrastructure works are complete to allow safe access, your build can commence. Once you decide to Custom Build with Potton you will have unlimited access to our acclaimed Self Build Academy to help guide you at each stage of the process and visit the show centre in St Neots which will inspire your imagination. Infrastructure works will be taking place during the autumn with a view to having the site ready for the new year. NB. reservations will be refundable until the S106 is clarified.